"41HS825, 2003.08.1421, Burial 1, Vessel 1" by Timothy K. Perttula and Robert Z. Selden Jr.
DECORATION (INCLUDING MOTIF AND ELEMENTS WHEN APPARENT): The bottle body has vertical and hooked arm scrolls that originate in hatched triangular and open oval-shaped elements and repeat four times on the vessel; there are ovals (eye-shaped) and circles within the larger triangular and oval elements. The scrolls have wider excised areas on either side where the hooked arms pass each other. 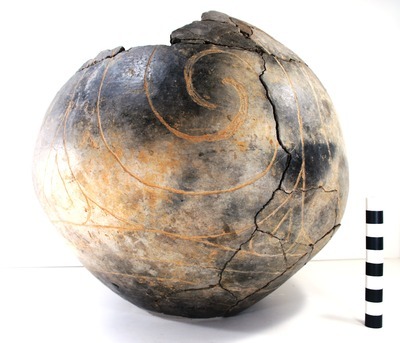 The lower part of the neck of the olla has a series of short vertical incised lines. Wilder Engraved, var. unspecified olla, Burial 1, Vessel No. 1, Patton site: a, side view; b, olla neck.